On Wednesday, December 5 at 9:00 p.m. Eastern time the fall finale of Chicago Fire is officially going to arrive on NBC and with that in mind, it’s fair to say that you should expect some craziness! This is going to be an intense, dramatic way to put a pin in the first half of the season, since we will see characters in danger and lives will be tested. So as we start to lead into this final episode, why not check out some of what showrunner Derek Haas had to say to CarterMatt about it? 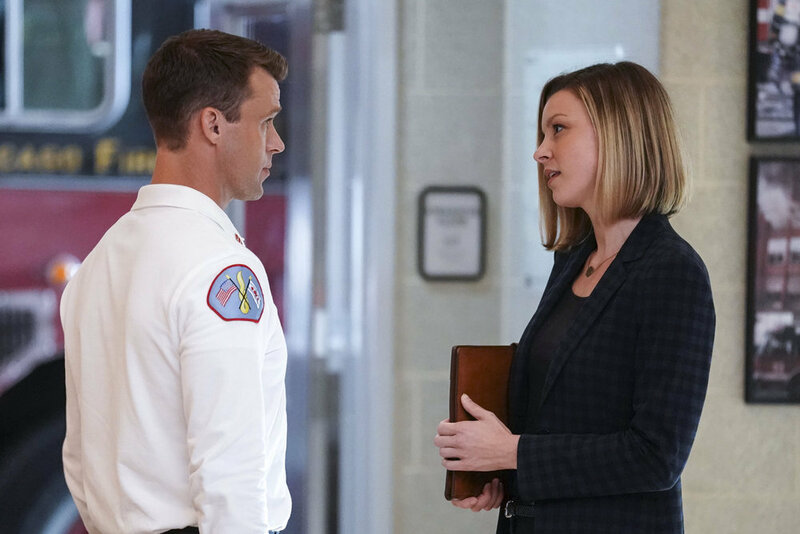 In our interview with Haas he details the next move for Kelly Severide, talks about Naomi and Casey, and then shares a few more details on what’s coming up on the other side. New One Chicago video! – To go along with this interview, take a look below at our latest Q&A with readers that includes several teases on the One Chicago fall finales and more. Be sure to subscribe to CarterMatt on YouTube and take a look at our full One Chicago playlist. We have new videos up at the channel daily so don’t miss out! CarterMatt – Okay, so let’s just kick things off with this when it comes to the fall finale — how much are people going to be worked up over the ending? Derek Haas – They’re going to be cursing the Haas name, as sometimes they do. I was telling another interviewer that I showed my boys the episode and they were like ‘how can you do this, dad?! They’re going to be so mad at you!’ I get it from inside my house — not just from Twitter. It’s going to be crazy, especially the last ten minutes of the show. I like how you’ve formed this sort of relationship with the fans on social media where you can be almost at times like a professional wrestler, in between the Gorsch campaign posters and the way that you can egg some fans on. Do you welcome this role? After seven seasons of tweeting, I don’t mind it. I like the bad guys sometimes — if they’re well-written and acted well enough, you get the response you want. I remember Hope at the beginning of last season when everyone was cursing my name over her (laughs), and then we got the Gorsch role. I gotta give props to Neil McCormack, the writer’s assistant on the show. He’s the one who came up with all of those buttons of Gorsch that I kept putting out on Twitter. But yea, I like to toy with the fans. It’s a part of it. You can’t open up Jurassic Park and expect all of your dinosaurs to stay in their paddocks! Before we get into the finale, let’s touch on a few important things from this season so far. What went into the choice to kill off Benny Severide? We were looking at the first half of the season, and we typically reserve our big swings for the premiere or the finale. I remember last season, we were kind of in the middle and it felt like we weren’t turning big stories in the way that we should. So, when we got in the writers’ room this past summer, we said ‘how can we turn a big card in the first half of the season?’. We had this Gorsch storyline going, so we thought about having Benny come back and having Severide go to his dad. The last time we saw them, it was super-heated; so, what if he had to go to him with a little bit of his hat in hand, saying ‘can you do this favor for me?’. Then his dad dies and Severide doesn’t know that he actually did the favor — we wanted to see how that could impact multiple characters and deliver some episodes that are dramatic and heartfelt and all of those things. We were looking for bigger swings earlier in the season. We did it in the third episode where we had Herrmann move to engine — that was a big move that was a long time coming. Then, with Benny dying, it was about delivering a big thing that people wouldn’t see coming. How is what happened with Benny going to continue to factor into what’s happening with Severide? He’s not in a good place. He’s definitely reacting to his dad dying in a self-destructive way, as Severide has done in the past when faced with tragedy. He has this moment where he reflects with Casey that he’s in a state of mind where he wants to wreck things, so when Tyler, who is Stella’s old friend from high school, shows back up at the firehouse, let’s just say that it does not go well. It’s out there in the promo for the fall finale that Naomi and Casey share a kiss. We’ve already seen that Casey sees some of the same passion in her that he saw in Dawson, but in introducing that character now, is that meant to send his brain and his mindset in a number of different directions as he’s wrestling through everything with Gabby? Yeah. To me, he’s having a reaction that is human. He’s hurt. She left — it wasn’t him leaving — and even though he kept up a brave face for her and kept his chin up, he’s angry and he’s hurt. When you’re faced with those emotions and you feel in a way rejected and your marriage is crumbling, you want to show yourself and the world that you’re attractive and you still got it. Here comes a woman who is smart, aggressive, and good at her job in the way that Gabby is. They get swept up in the moment of excitement while investigating these pretty bad people who are making these fire-trap trailers. One thing leads to another. I’m not saying that it’s the best decision Casey’s made, but that’s what’s happening. Beyond the fall finale, is there anything else coming up that you’re excited about? I can tease a few things! In Chicago, they do the Polar Plunge for charity — the Special Olympics. I participated in it and a lot of our actors are as well. It’s where you’re crazy enough at 10:00 in the morning in the winter to run into Lake Michigan. We’re going to do a Polar Plunge episode at the firehouse. We’re going to do an episode the same week as Valentine’s Day and we’re calling it the Galentine’s episode. Our leading ladies are going to go on a road trip to Indiana to see Brett’s hometown. We’re also going to have Gary Cole back as Commissioner Grissom and he’s going to be back in the second half of the season. Are you hoping for another big crossover? Yes! At least for now, we’re in the early planning stages of doing one with PD, so it will be a two-hour thing with PD. It’ll be centered around a crime happening in a firehouse that is close to ours, and we’re going to get involved. Are you already starting to think about the future beyond this season? The ratings for this One Chicago lineup have been really impressive. I’m loving the audience response to One Chicago all being on one night. I can’t believe how much they’ve embraced it … but I never count my chickens before they hatch. There have been times when it comes down to May and we’re still waiting. I’m feeling great, but that’s somebody else’s job to worry about. Related News – Check out our recent interview with Rick Eid all about the Chicago PD fall finale!